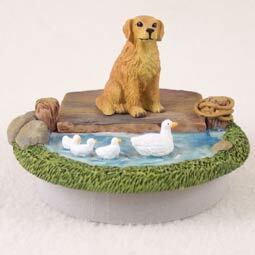 Golden Retriever Candle Topper Tiny One "A Day on the Lake"
Home > Dogs All > Golden Retriever > Golden Retriever Candle Topper Tiny One "A Day on the Lake"
The Golden Retriever originated in the Scottish Highlands in the late 1800’s as a hunting dog that could handle the Scottish landscape and the game in that area. With an average size of 55-75 pounds, this energetic, friendly, intelligent, adaptable, “eager to please” breed quickly became one of the most popular dog breeds according to the AKC registration listings. The Golden does require daily exercise to keep them in shape and burn off excess energy. Their double coat is water-repellant, and does shed seasonally, so regular brushing is important. Today’s Golden remains a superb water hunting dog, but is also used as a service dog, guide dog, therapy dog, search and rescue dog, and loyal family member.